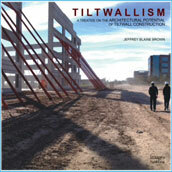 Tiltwallism: A Treatise on the Architectural Potential of Tilt Wall Construction is written by Jeffrey Brown, FAIA. 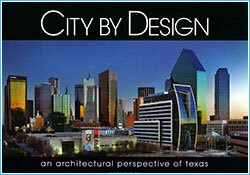 The title encompasses all professions who are involved in this approach to “investment” architecture. Tilt wall’s history, methodology and connection to current architectural approaches are expound upon throughout each chapter and concludes with a series of case studies examining the role of tilt-up. Our self entitled book covers 20-plus projects and is over 100 pages. Each project speaks of our design philosophy, what we have set to accomplish… a unique balance of design excellence and technical superiority. 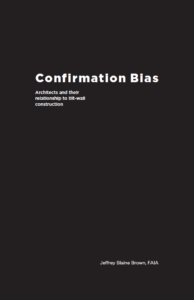 Confirmation Bias is a series of letters written by Jeffrey Brown, FAIA, during his presidency of the Tilt-Up Concrete Association as a follow up to his talk at the International Tilt-Up Convention and Expo in 2015 titled, “Observations on the Quotidian.” The letters explore a peculiar relationship between the practicing architectural community, the architectural elite and academia, the construction industry and commercial development realities. 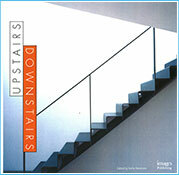 Often found at the heart of a building, stairs still represent fundamental circulation spaces despite the prevalence of and necessity for lifts in more recent building designs. This new publication takes a detailed look at an incredible range of stair designs and reveals that stairs can provide more than just the transition from one level to another. For example, they may also be the focal point in a home, a decorative feature in a public building or a practical circulation space in an office block. Industrial Spaces features designs derived from the need of various industries to provide efficient, safe and workable spaces for both operations and administration, while at the same time complying with rigorous industry standards and incorporating the latest technology. The setting of the industry itself also influences such space, whether it be on an industrial estate, on the city fringe, in a rural precinct, or an inner urban area. Far from the utilitarian constructions of the past, today’s industrial spaces are award-winning architectural masterpieces. 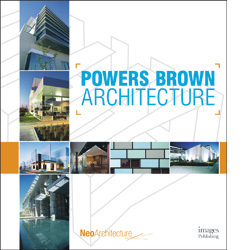 Showcasing prominent commercial structures and the talented architects who brought them to life, these pictorial histories contain outstanding photography of some of the leading cities in the United States. Offering insight into the diversity and progression of metropolitan architecture, different firms represented in this series discuss the influences found in their featured work. Illuminating the unique and defining characteristics of each building, the process that brought it to fruition, and the impact each structure had on the community at large, these artistic chronicles will delight lovers of architecture, travel, and urban living.